An image slider with a unique effect. Mixing words and images of your post in an elegant animation. ACTUS Animated Words Slider is not just another image slider. You don’t need to hassle with hundreds of options. A unique, animated slider is created automatically for each of your posts, using the most used words of your text and all the images of your post. The featured image, attached images, the images used in your content, images used in galleries and any extra images you want to upload. The result is a beautiful animated slider, zooming and rotating the images, with soft transitions between them, and overlaying animated words from your text over the images. Just use the shortcode [actus-awslider] to put the slider anywhere in your content or include it in your templates. 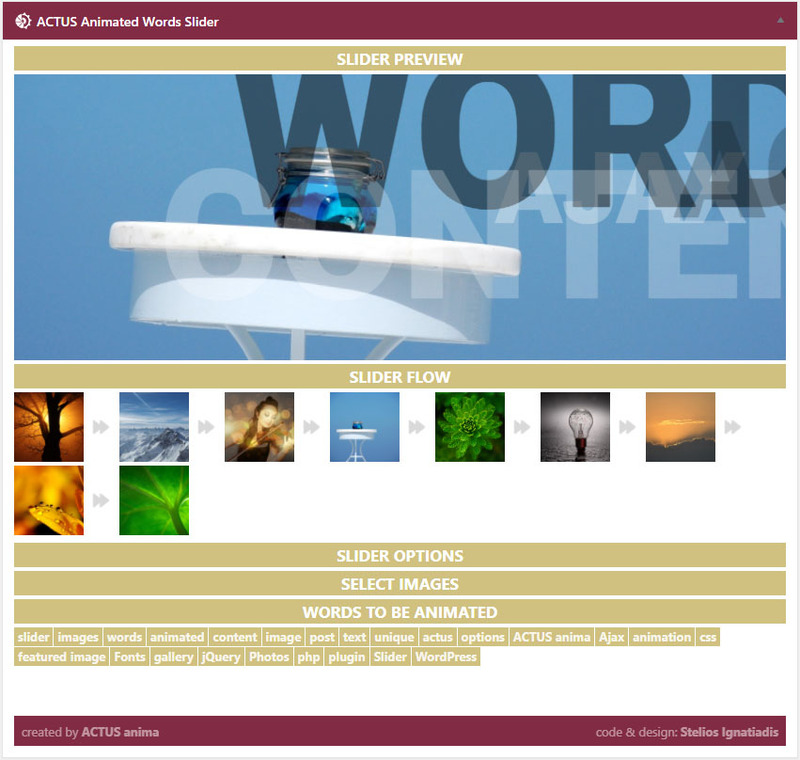 ACTUS Animated Words Slider creates the slider using your existing content and you are ready. Reads your post content and extracts the most used words in it. Reads all images used in your post ( featured image, inline content images, galleries images, attachments ) and creates an animated image slider. Exclude images from your slider flow or add new images to it. Exclude words from your animation or add new words or the post tags. Adjust transition time and slide display time. Enable or disable zooming and/or rotation of the images. Adjust the density, the opacity and the speed of the animated words. Adjust the size of the animated words and their font (coming soon) or color. You can have great control in all the details of your slider in case you need to refine it. Every change you make in the slider’s options, is updated in the slider preview in real time. Let’s examine the settings screen of ACTUS Animated Words Slider. Here you can see a preview of your slider. If you are creating a new post and you have no images, the SLIDER PREVIEW will be closed and the SELECT IMAGES panel will open. You can add images for your slider in that panel or in your post content. Here you can see your slider flow. You can drag and rearrange the images to change their order. There are many options you can change to trim your animated slider. height – Defines the height of the slider. transition time – The time for the transition between images (in seconds). slide time – The time every slide will be displayed after the transition is completed (in seconds). image zoom – Enable or disable the image zooming. image rotation – Enable or disable the image rotation. words – Enable or disable the words animation. opacity – Increase or decrease the average opacity of the animated words. speed – Increase or decrease the average speed of the animated words. font size – Increase or decrease the average font-size of the animated words. colorA – The main color for the animated words. colorB – The secondary color for the animated words. It will appear less than the main color. density – Increase or decrease the density of the animated words (how many maximum words will be visible at the same time). font – Change the font of the animated words (coming in next versions). Here you can choose which images are going to be in the slider. Clicking on a thumbnail will remove the image from the slider flow if it is already there, or add it if it’s not. attached images – the first image in this box, is the featured image of the post (if there is any) and the rest are extra images uploaded by you clicking the ADD IMAGE button. conent images – images automatically retrieved from your post content. from galleries – images used in post galleries. Here you can choose the words that use in the animation. Clicking on a word adds or removes it to the list that will feed the animation. post content – ACTUS Animated Words Slider scans your post contenet and finds the words that used more often. The number next to each word, indicates how many times it is used in your content. There are two parameters you can alter to refine your results. Minimum characters, and minimum times used which are pretty much self explanatory. You can access the parameters by clicking the gear icon under the label. other words – here you can type any words or phrases, seperated with comma, that will be used in the animation. Activate ACTUS Animated Words Slider from your Plugins page.